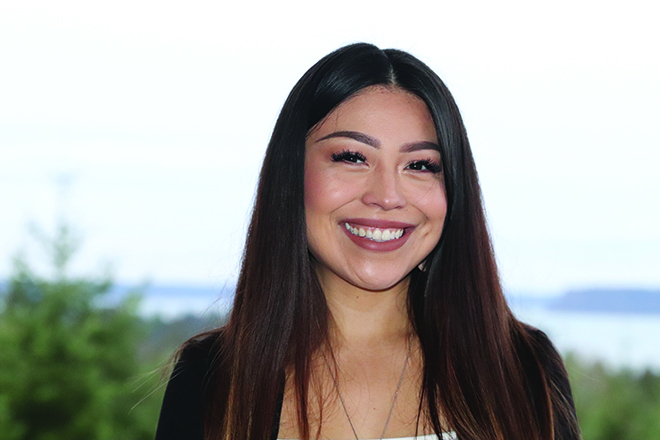 Tulalip tribal member, Sheniece Lane, found her passion at a young age while working at the Tulalip Resort Casino. After years of working in the Guest Service department, she decided on a new venture with the luxurious 14,000 square-foot T Spa. During her tenure there she gravitated toward an array of products such as toners, serums and moisturizers, learning how certain skincare products are catered to specific skin types. With an established interest in beauty cosmetics, including makeup and lashes, as well as self-care, Sheniece found her true calling as an esthetician while in a managerial position at the spa. This allowed her to gain as much product knowledge as possible and experience a number of services including facials and waxes. During her early days at the spa, Sheniece could usually be spotted on the retail floor with a box of exfoliator in one hand and an eye-cream in the other, carefully studying the ingredients to get an understanding of what the products did and who they were made for. Sheniece would also often pick-the-brains of the T Spa estheticians, inquiring about which masks and peels were best for particular individuals, whether they were dealing with acne, wrinkles or rosacea. After months of learning, she pursued an esthetician license by enrolling in a beauty academy. Now a couple years down the road and after many exciting life events, including a baby and a recent engagement, Sheniece is a highly-recommended esthetician at the place where it all began, the T Spa, and she’s ready to help her community learn about their skincare needs. Let’s begin with your personal skincare journey. What made you decide to become an esthetician? Working at the casino offered a lot of different opportunities for me. One of the top roles I had was working at the T Spa. The environment was so supportive of where I wanted to go with skincare; it was informative. I was able to grow and learn about the skincare industry and how to sell products. Having all that product knowledge really opened my eyes to the benefits of skincare and made me want to educate other people in the same sense. That was the number one reason that made me want to pursue my esthetician license and career. Skincare is something that is often overlooked, why do you believe taking good care of your skin is important? Our skin is the largest organ of our body. It’s also the largest barrier against infection. If we have cuts and are not taking good care of our skin, we’re exposing ourselves to infections, toxins or environmental factors. It’s really important to maintain a proper daily skincare regimen that’s going to help prevent any early signs of aging and wrinkles. The overall goal is to continue to provide a strong barrier for your skin because that’s how we stay away from getting sick or any illnesses. For those who are new to skincare, it might be surprising to learn that certain products are geared toward specific skin types. What are the different types of skin? I can go into huge detail about that, but I’m going to try to summarize it; a lot of people have normal skin. There’s normal skin, dry skin, couperose skin, mature skin and oily skin. People with normal skin typically have smaller pores; they have a really good firm muscle texture to their skin. They’re going to be rosy around the cheeks and they have really good smooth texture on their skin. No pigmentations or lesions because they have an ideal skin type. Dry skin is obviously going to be lacking circulation. Couperose skin are people who have telangiectasia or rosacea, so they either have dilated capillaries like red veins or their skin looks flushed and red. Mature and acneic skin are self-explanatory. While people with oily skin types have more thick skin and a little bit of texture to their skin. How would one assess their skin type? If someone is breaking out quite a bit, I’d recommend seeing a dermatologist because it’s usually due to an allergy. I also advise people to come and get a skin consultation with an esthetician at the T Spa. It’s better to do it in person because it’s easy to self-diagnose ourselves, but most of the time we’re wrong. If someone has questions, everyone is really helpful and if they’re looking for a product we can suggest that for them really quickly. What kind of skincare treatments do you offer at the T Spa? The primary treatment I’m doing at the spa is the European facial. It’s essentially a customized skincare facial that’s super relaxing and educational for the client. I ask if they have any concerns, and most people don’t have any they just want to come in for the relaxation portion of it, but some people will come in and say they have clogged pores, hyperpigmentation – which is also known as dark spots that’s from an overextended period of time of sun exposure – or they have acne problems. I customize any of the products we have to target those skin concerns. What’s most important is educating my clients to use the proper skincare line. If you were to come in and say, I’m breaking out and I want to get rid of this, I’d suggest some products to you that would fit specifically towards your needs. Another great facial to book is definitely the T Spa signature facial. That’s a good way to figure out if you wanted to do further anti-aging treatments or peels. If you wanted to get a regimen going at home, we can target what your skin needs at that time. Let’s talk about establishing an at home regimen. What skincare products are essential? The biggest thing people need to do is exfoliate and the reason I say that is because our skin layers are always shedding every day. When we’re not exfoliating we get buildup of oils, dirt and debris. What you want to do is exfoliate two times a week at a minimum, three time at the most. That helps bring circulation to the skin, it helps slough off your skin so you have supple, texture-free skin. Serum’s are important too because they have anti-oxidants. Antioxidants help detoxify and create a barrier against the elements. You ideally want to have a moisturizer on, because it’s cold out now and that takes away the moisture from our skin. Use that serum under a moisturizer to help prevent dehydration in the skin, combat signs of early aging and hyperpigmentation. And also any moisturizing cream that you like to use. Those three things I feel are a great start for people because most people claim to just use a bar of soap while in the shower and that’s it. Oh, and an eye-cream too! Because that’s another place where we start to show early signs of aging. What are your top three favorite products? Monoi H Corrective Exfoliating cleanser. It’s my number one product I recommend to people. It’s gentle enough to exfoliate your skin but it’s still hydrating, it’s not going to strip your skin of any of its oils. My next product I like is a Rose Hips Seed Triple C and E Firming serum. Vitamin C and E are really good for your skin because it helps maintain your moisture and hydration levels, it helps fight free radicals, wrinkle prevention and targets dark spots. It’s really like an all-in-one serum and that’s something I tell people to use under their moisturizer. My third favorite is Bearberry Eye-Cream by Eminence because it helps target pigmentation under the eyes as well as inflammation and puffiness. And also their Artic Berry Peptide Illuminating Cream, that helps with uneven complexion and it looks like your skin is glowing. What are the products to stay away from? Stay away from St. Ives mango scrub or apricot scrub. Those microbeads are so bad for your skin. You don’t want those big beads tearing away your skin because that opens your skin to bacteria. And when you’re opening your skin to be that susceptible, then you’re getting more breakouts. They’ve been a little more proactive about not using microbeads in products anymore because it’s harmful for fish, sea life and the creatures of the ocean. And I don’t want to bash them, but I don’t encourage people to use Proactive. Their products were found bleaching people’s washcloths. So for the product to be that potent, those ingredients are not safe for people’s skin, especially those with acne. The biggest misconception people have is when they get a breakout, they immediately think they have acneic skin, and no, you’re having a breakout. The biggest contributors to breakouts are diet and stress. Stress plays a huge role, so it’s important to incorporate meditating, disconnecting or journaling because there’s so many ways our bodies communicate with us and that shows up as acne. You mentioned diet playing a role in our skin health, can you expand a little more? Most people typically are eating an inflammatory diet. The best thing for your skin is to always stay hydrated. Try to drink at least eight, 8oz glasses of water a day and carry a water bottle with you. Hold yourself accountable to staying hydrated because what that’s doing is completely detoxifying our system. Try to eat non-processed foods, anything that comes in a package. Try to eat wholefully, like vegetables and fruits. Fish is really good for our skin because of those omega-3’s, that helps oil production and collagen production, which helps keep us looking younger and our skin glowing. So our ancestors knew what they were doing? They really did! I think that speaks for itself because a lot of our Native elders don’t have really bad wrinkles, they look youthful. Any tips on staying consistent with your daily skincare regimen? I struggle with that too, don’t get me wrong. Sometimes if I’m not wearing makeup during the day, I’ll want to skip it. Which is okay. If you’re a guy or not a frequent makeup wearer, it’s still important to incorporate some type of toner at the end of the day because if you’re around any dust or dirt, that’s still holding onto your skin. The best advice I have to staying disciplined is before you get into bed, go to the bathroom, wash your face after you brush your teeth and make it a routine. It’s important to remember that when you’re sleeping, your skin is regenerating. I skipped out a couple of times. I just got over a bad breakout, I wasn’t cleaning my skin and was eating terrible, and it was showing. I didn’t want to do anything, I was hiding away and wearing hats. It affects your self-esteem when your skin isn’t doing good. If you think about it, you’re taking care of yourself; it’s great self-care. And you’re setting yourself up for success for the next day, because for me, when I wake up in the morning and see that my skin looks really good, that sets the tone for the rest of my day to perform at my peak. Sheniece is currently working weekends at the T Spa and encourages anyone with skincare questions to visit. To book a facial or skin consultation, please contact the spa at (360) 716-6350. Sheniece is also working to expand her brand, recently investing in an organic skincare line named Beauty Counter, that avoids using several harmful ingredients that are banned in countries other than the U.S. She will also be hosting a number of pop-ups throughout the Tulalip reservation, using the new product line to conduct skin evaluations and mini-facials. Be sure to follow Sheniece’s Instagram page, @sol.beauty, to stay updated on her latest skincare and beauty news, as well on any upcoming pop-ups with her new Beauty Counter skincare line.